Sunday’s were made with for roast dinners; this Pork Roast is made all the more special with roasted apples and a cider gravy! I first posted this recipe back in 2012. I was still living at home and this roast dinner was a big deal for me as it was the first time my Dad had let go of the reins and let someone else cook the Sunday Roast. My Dad is a bit of a traditionalist so often we had a roast chicken with all the trimmings. At Easter he’d bring out a big leg of lamb and Christmas was always the turkey. We would have beef with horseradish and Yorkshire puddings every now and then but it was the Roast Chicken that often took centre stage. So, when it was my turn to cook the Sunday Roast I jumped at the chance to cook a joint of pork. Pork is by far my favourite meat so I bought a large pork shoulder, dug out a bottle of cloudy cider and set to making my Roast Pork with Apples and Cider Gravy. Pork and apple is a classic combination. Most people will be familiar with putting a dollop of apple sauce on to of their meat on a Sunday but I wanted to do something a little different. As well as finding roast potatoes cooking in the pan with the pork joint, I also add shallots and apples. The apples bake much like the roast potatoes do. They are soft on the inside but the skins also crisp up a little. They flavour and texture is ten times better than the usual jelly like apple sauce you get in a jar. The apple juices also add to the pork juices in the bottom of the roasting tin which gets used to create my awesome cider gravy. Living with a vegetarian, we don’t have roast dinners very often any more. They are almost always reserved for special occasions when we are entertaining guests and today was no exception. Today we hosted my parents and grandparents for dinner. The Roast Pork went down a treat as did the Blackberry Trifle I served for afters. Thanks to my well planned out schedule (which you can see more of below) when my guests arrived everything was well under control. The meat and veggies were in the oven and the gravy was bubbling away. All I had to do was put on the veggies to steam 5 minutes before we were ready to sit down to eat. Easy peasy! 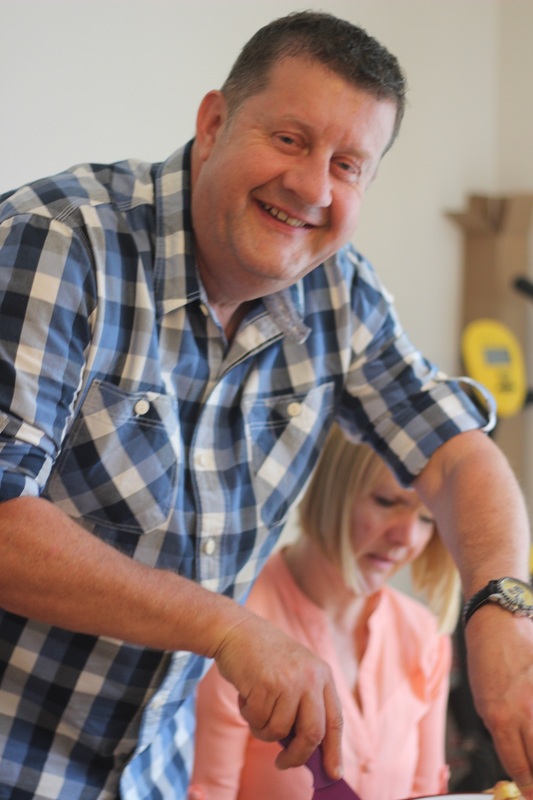 Although I’m well versed in cooking a roast dinner, it’s still nice when we have Dad over to let him carve the joint. After all you have to respect your elders don’t you! He’s cooked so many roast dinners for me it’s nice to be able to return the favour once in a while. The one thing I love about this Roast Pork though is how its cooked my way. My Dad’s very traditional so adding apples to the pan and serving it with a cider gravy isn’t something he’s likely to do every week. Gravy as knock out as this is a real treat for him and my mum. Seriously…the cider gravy alone is something to get excited about! But I digress…lets get down to the nitty gritty – how do you cook Roast Pork with Apples and Cider Gravy? Yield: Roast dinner with all the trimmings! Pat dry then score the skin and fat on the join and rub with vegetable oil and a generous helping of salt. Leave this to one side for half an hour. Pre-heat your oven to 220C (gas mark 7). Place the joint into the dry hot oven on it’s own for 30 minutes to help the skin crisp up. Remove from the oven and add the apple wedges and whole shallots to the roasting tin. Pour over 250ml of the cider, cover with tinfoil and place back in the oven at the lower temperate of 140C or gas mark 2. Grab a book, or turn on the TV and sit back for half an hour. Next, par boil the potatoes for 5-10minutes until they are tender. Heat a little vegetable oil (just enough to cover the base of the pan) in the oven for 5 minutes until piping hot. Drain well then toss the potatoes in a little flour before transferring to the oil coated pan. Pick up that book again, or take the TV off pause and relax for another 15 minutes. You’ve got this under control! Place the parsnips into the roasting tin alongside the roast potatoes to cook. While the roast joint and vegetables are finishing cooking, fry off the sliced shallots in a little oil. Add the cornflour and cook for a few minutes. Take the joint out of the oven to rest (by this point it should have had roughly 2 hours in the oven), and transfer the majority of the juices to the pan with the shallots and cornflour. Take off the fat and skin with a sharp knife and pop back in the oven on high while you finish the gravy. Stir the gravy until the cornflour has dissolved. Add the cider and stock to the pan and cook for 10 minutes until the gravy is piping hot and has thickened. In the final 5 minutes before serving, steam the carrots and spring greens above a pan of boiling water. Best served on warmed plates. The key to planning your roast dinner is first to work out the time you want to serve the roast (T). For us that was 2pm. You then need to work backwards so you can set timers reminding you when to put each element on. The following is based on a 1.5kg joint which takes 2 hours to cook. T minus 2 hours - put pork joint in the oven. T minus 1.5 hours - put apples and shallots in with the joint and reduce the oven temperature. T minus 1 hour - par boil the potatoes before putting them in to roast. T minus 45 minutes - put the parsnips in to roast. T minus 15 minutes - begin prepping the gravy. T minus 5 minutes - steam the vegetables. 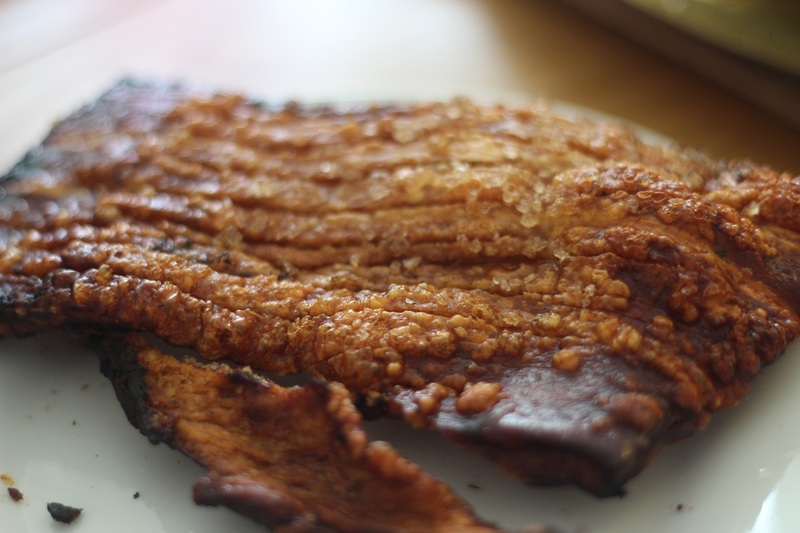 Oh, and did I mention this recipe produces AWESOME crackling?! I love hosting and cooking a roast dinner for friends and family is a lovely way to show people you care! 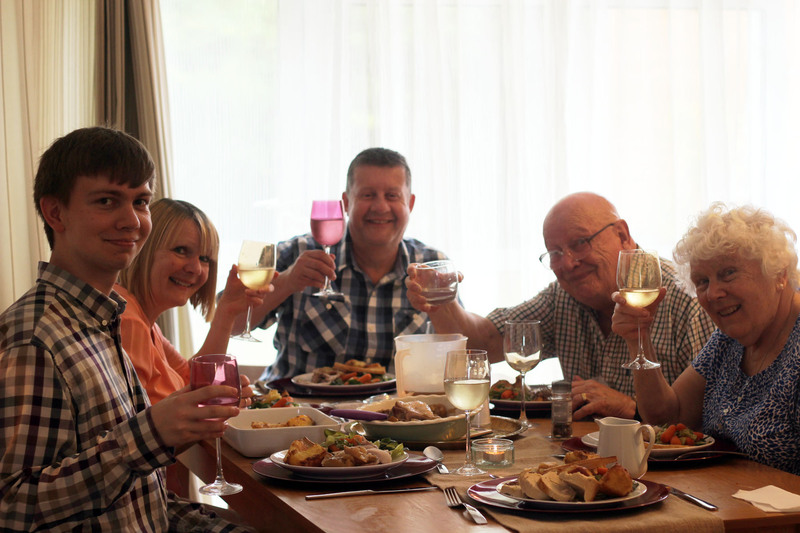 You can’t beat having loved ones round the table, tucking into a meal you’ve cooked. Add in good wine and good conversation and you have the perfect Sunday! I hope you enjoy my recipe for Roast Pork with Apples and Cider Gravy. I can’t stress enough how good that cider gravy is – I could seriously pour it over everything! Next time you cook a Roast Pork, try this recipe and let me know how it goes! As always I love to see your pictures on instagram and twitter so please do share or leave a comment below. wow wow wow, my all time favourite dinner! Love the cider gravy too… Perfect! The photos of your family tucking in are just lovely! My dad also does all the cooking back at home too.Your pork roast sounds so yummy with the cider gravy!